Last September, I went through a phase making Indian food. 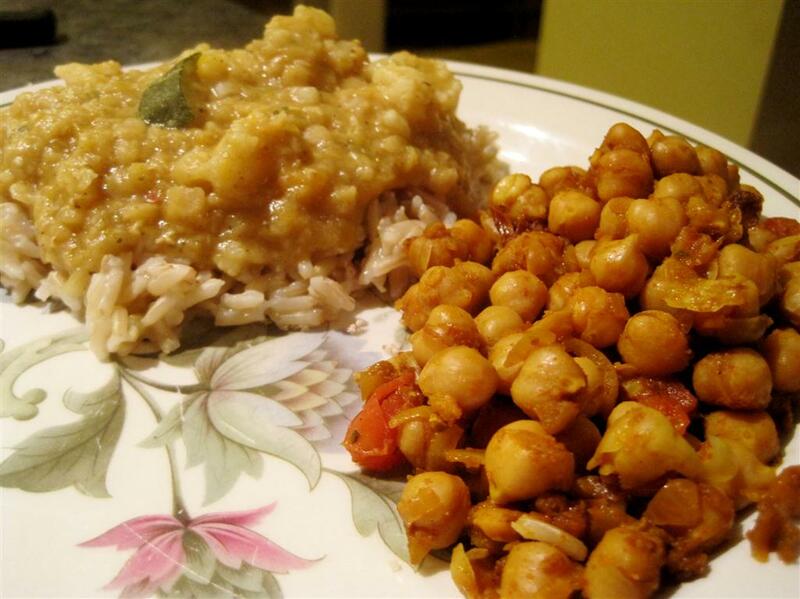 Chana Masala was one dish I made that was spectacularly easy and yummy! At the time, I didn’t have all of the spices mentioned in the recipe. 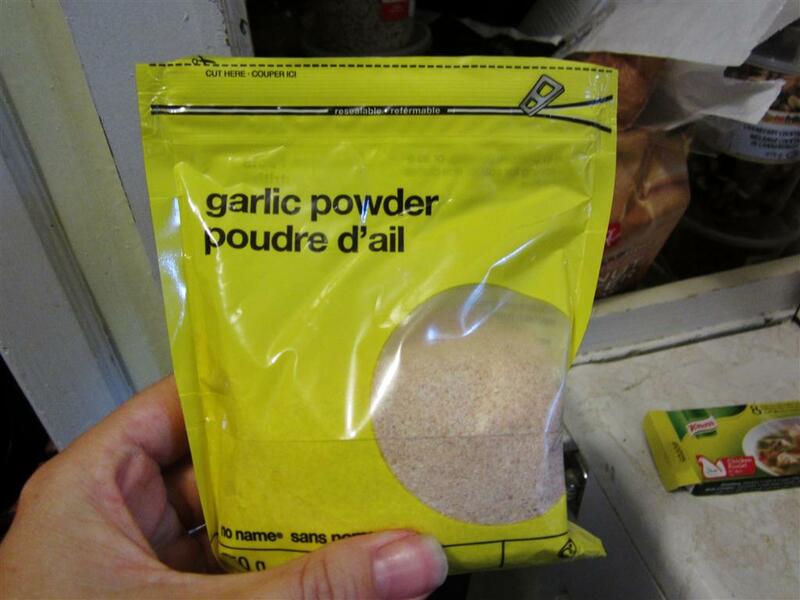 Last night though I made it again and this time, I had fresh Amchoor powder and Garam Masala on hand that I picked up at an Indian grocery store in Scarborough. It turned out delicious, again! It’s an incredibly easy dish. Once you have minced your onions and garlic, chopped up your two tomatoes and grated your ginger, it’s a straightforward fry to the end! 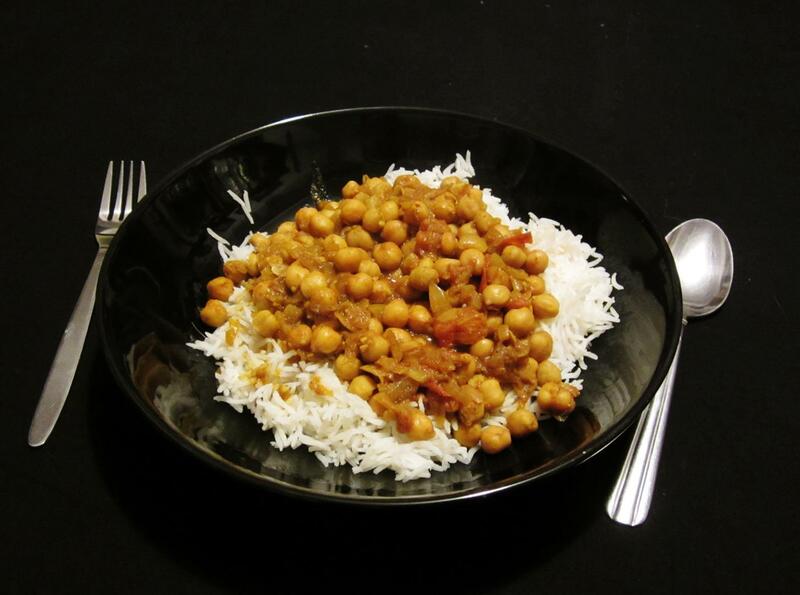 Oh, and don’t forget to put your rice on while you prep the Chana Masala! 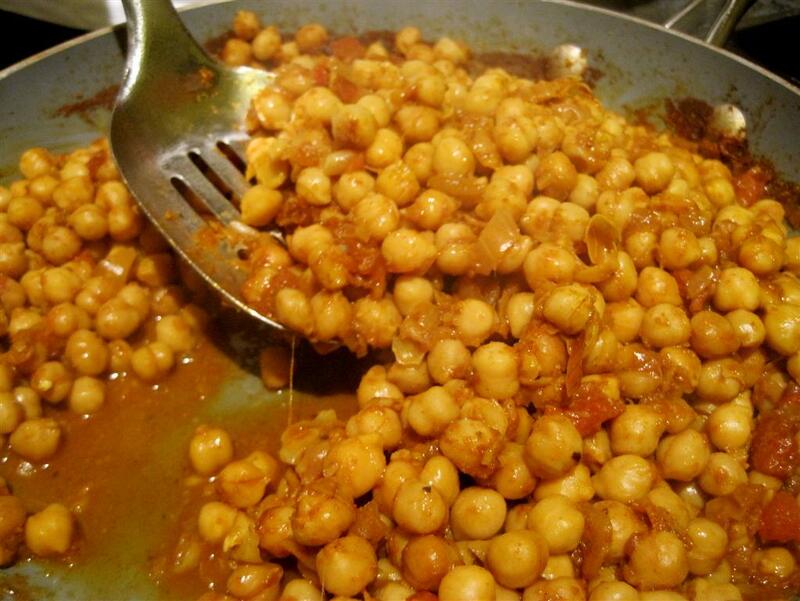 Chana Masala – Take Two! My initial attempt to make chana masala went extremely well. 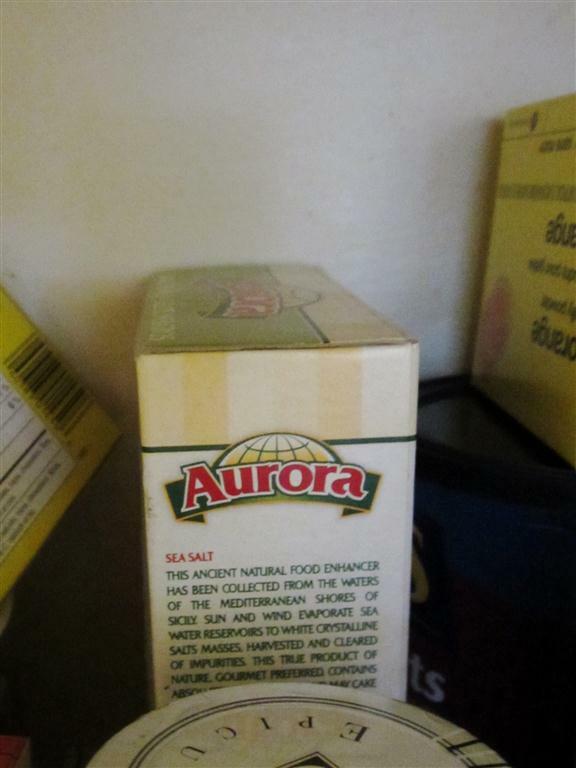 If you have never made Indian food before, as was the case with me, I would recommend this as a starter dish. It was honestly incredibly easy, straightforward and even after freezing and reheating, it continues to be delicious. 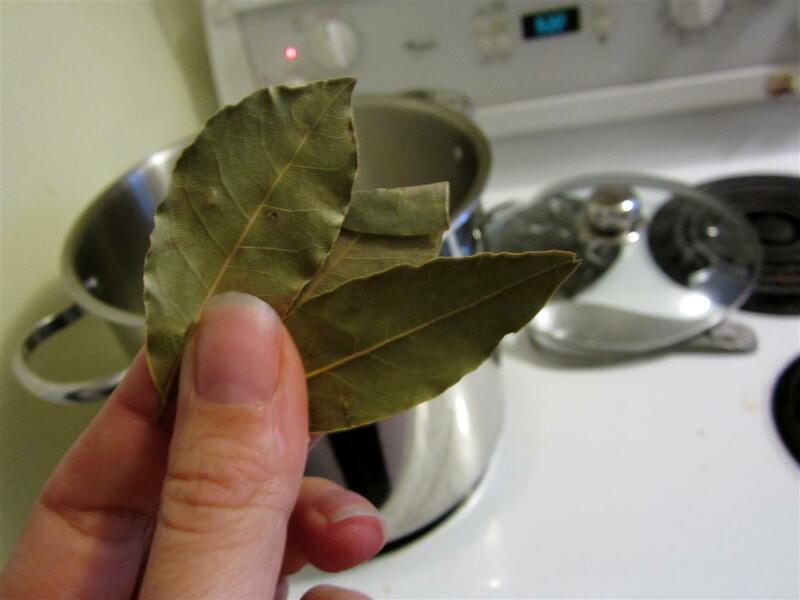 The only problem I had is that the recipe I found online called for ingredients I didn’t have on hand and that I couldn’t find: armchoor powder, cumin seeds and a hot green chili pepper (these are around…there just weren’t any at the two grocery stores I visited). So I simply left them out and hoped for the best. As I say, I lucked out…the dish turned out quite lovely…although I wonder how much better it would have been had I been able to find all the ingredients. Ah well, that’s just a reason to make it again! Click here for the recipe I used or scroll to the bottom of the post. Everything about this recipe was straightforward and easy…the most complex part is the preparation. Well, for me that is. I still take a long time to chop/mince/and otherwise prepare my ingredients. But once the preparation part is over…this recipe is beyond simple. 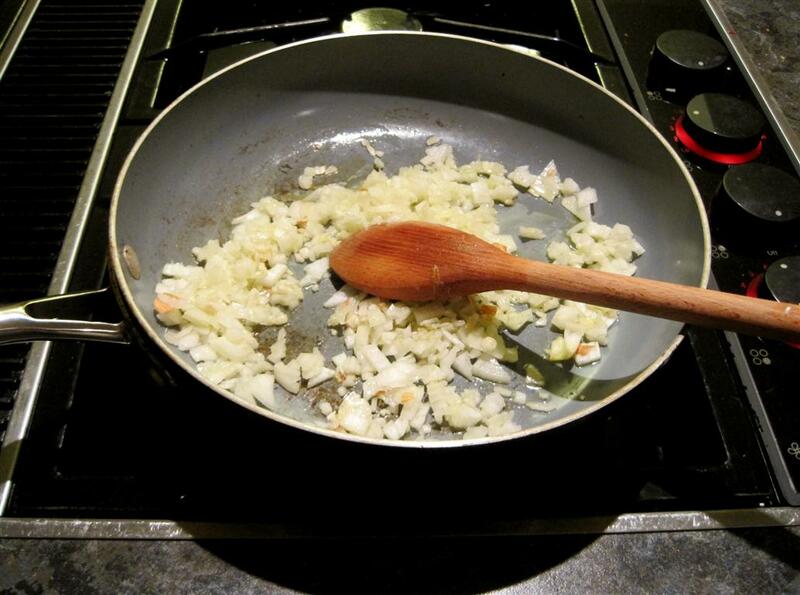 Start by sauteeing your onions and garlic. Once your onions are tender and browning, add the coriander, cumin (not the roasted cumin…considering I didn’t have any anyway…), cayenne and turmeric. At this point, the fragrance of the mixture is awesome although it’s quite dry. But that’s okay, moisture is coming! Stir the dry mixture just enough to fully cover the onions and garlic, I think I stirred barely 30 seconds, and then add the tomatoes. At this point, I added a small splash of water to up the moisture just a bit. 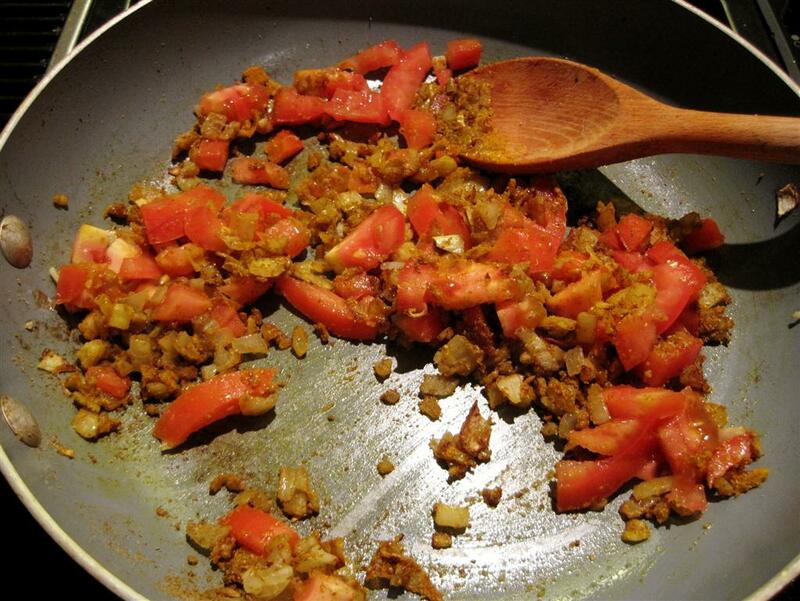 Cook the tomatoes until they begin to brown. 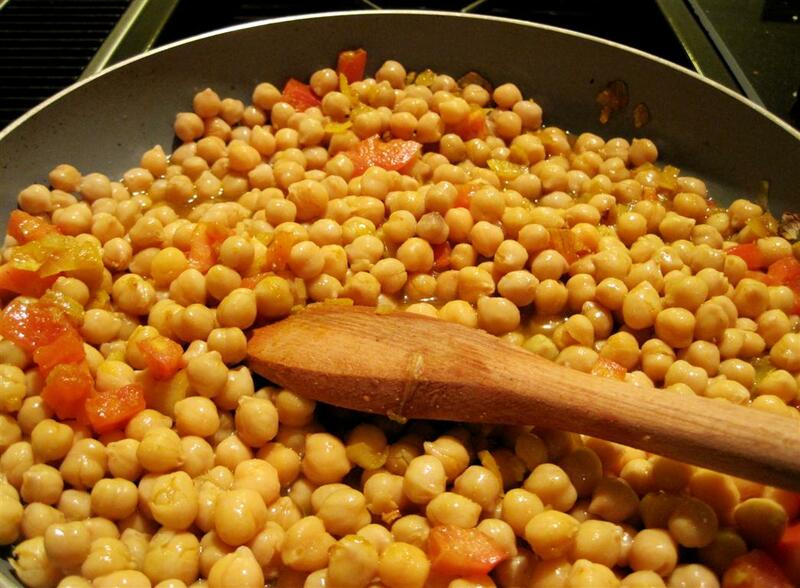 It is at that point you add the chickpeas, water, and remaining spices. Final step? 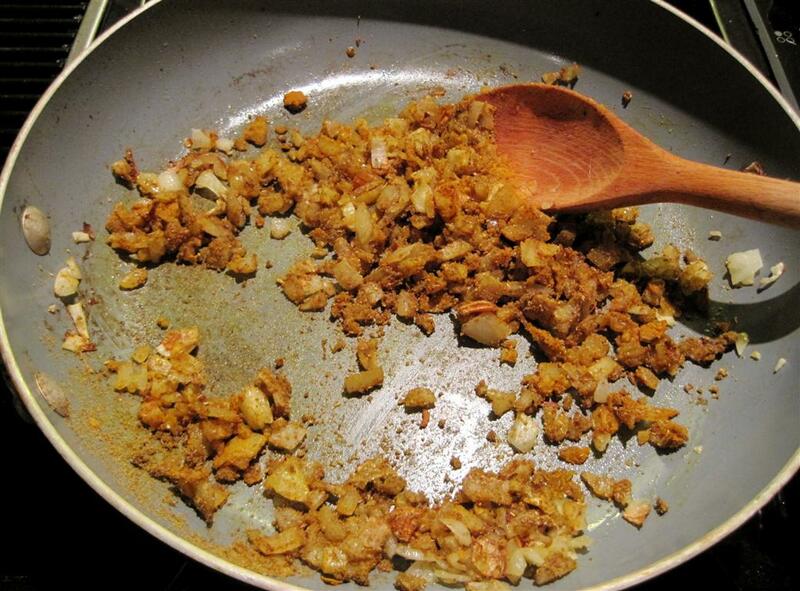 Uncover and add the grated ginger. At this point, I re-covered the dish and allowed it to sit on Low for an extra 5-10 minutes as I was waiting for the other portion of my meal to cook, so as long as you keep an eye on the moisture, you can allow it to cook a little longer. Add paprika, garam masala, salt and lemon juice. Remove the cover add the ginger. I recently had some friends over for dinner and the pile of black forest ham that remained in my fridge after everyone had left was substantial. There was no way I was going to eat it all and I wouldn’t have any help from B as he was away on tour, so I decided to make a soup. My first thought was that I didn’t want to make split pea and ham, which is where my mind went first when I thought about ham in soup. I wanted a vegetable soup of some kind and I had tons of vegetables in my fridge that were becoming green bin bound so I decided to throw it all in a pot and see what would happen. This is a big deal for me, as those who know me, know that I like recipes..measurements..structure…ORDER DAMMIT! I need ORDER!!! Since then, I have come a long way and I have learned that soup is one of the easiest, most malleable things to cook. If you’re baking and missing an ingredient, often it calls for a panicked trip to the store, but making soup…if you’re out of one thing, throw in something else! 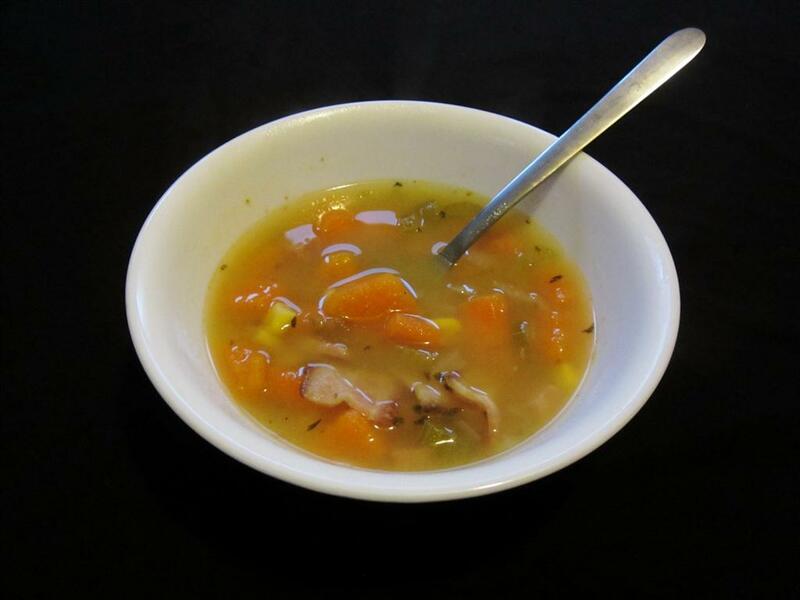 Taste, sniff, invent, get creative…soup is awesome! So, this soup doesn’t necessarily have an exact recipe. I took pictures of ingredients as I went along to help remind myself what I had added and I kept tasting the stock until it was just right. It’s all a pinch of this, a dash of that…I’ll try to give you an idea how much of each thing I used, but it was really all about the taste and my preferences. I’ll include most of the pictures I took in this post but I have to warn you, some of them are crap shots! As I grabbed stuff, I’d remember to snap a picture at the last minute so some are a tad blurry. So, first off, I put a pot of water on the stove. 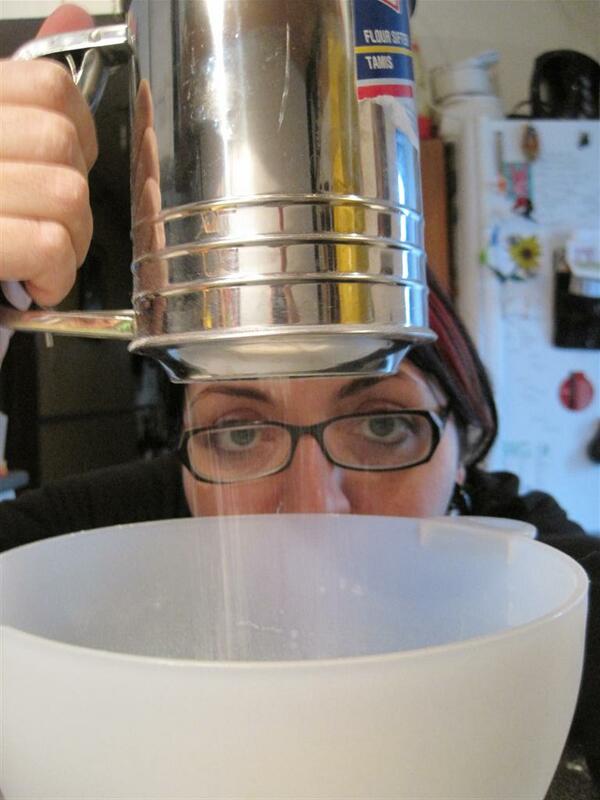 I ended up switching to a larger pot than the one in the next picture…I think I used 8+ cups of water….actually, thinking about it now, there was probably more than that….but again, I didn’t measure. 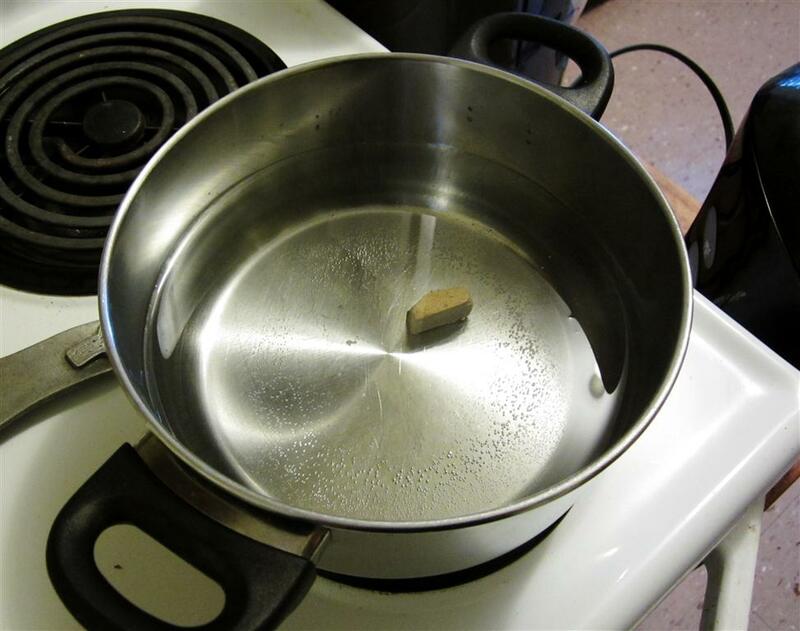 I added a chicken bouillon cube and left the water to boil. 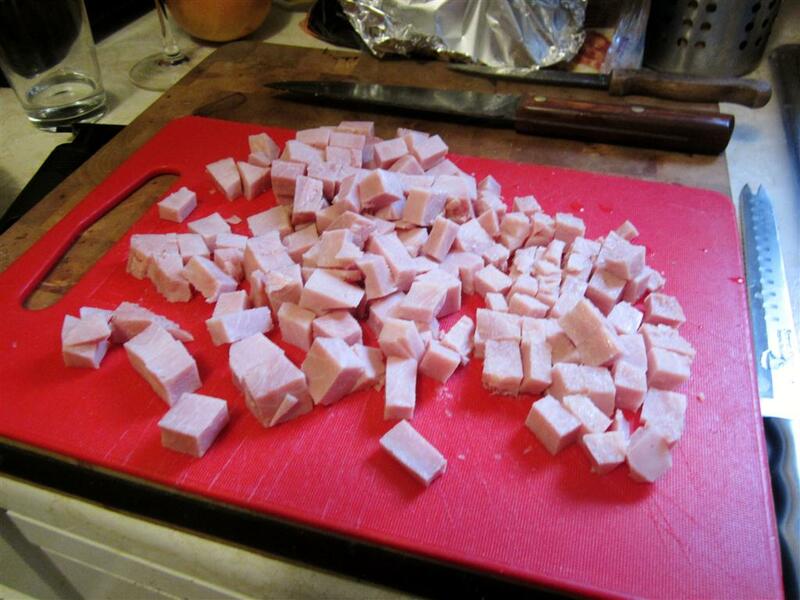 In hindsight, a vegetable bouillon cube might have made more sense…ah well. Proper stock would have made the most sense…but I didn’t have any and the ham was boneless so I didn’t have the opportunity to make any. 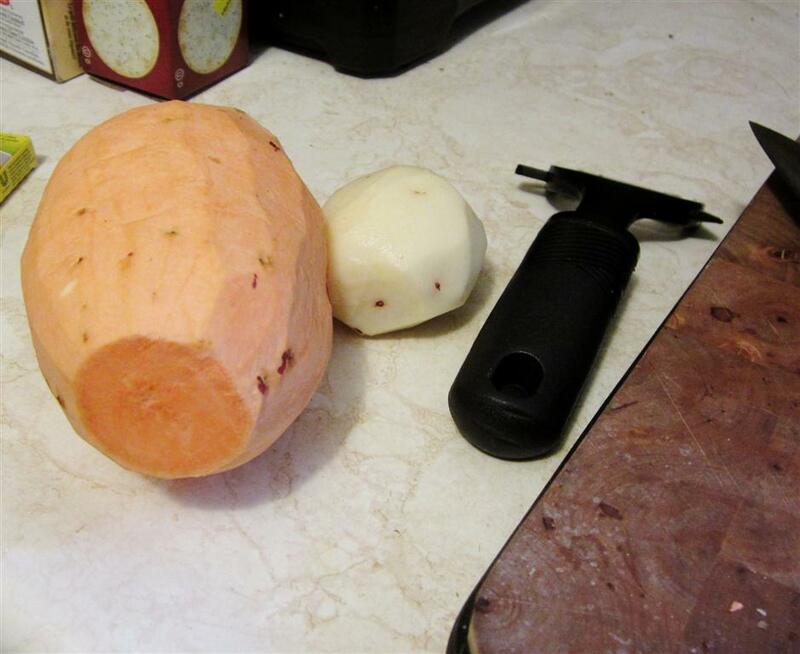 I looked in my fridge and found one small white potato and one GINORMOUS sweet potato. Sidenote: I looked up the word “ginormous” and yep, that’s how it’s spelled. Looks kinda dirty, doesn’t it? One potato, two potato, three-…nope, just two. 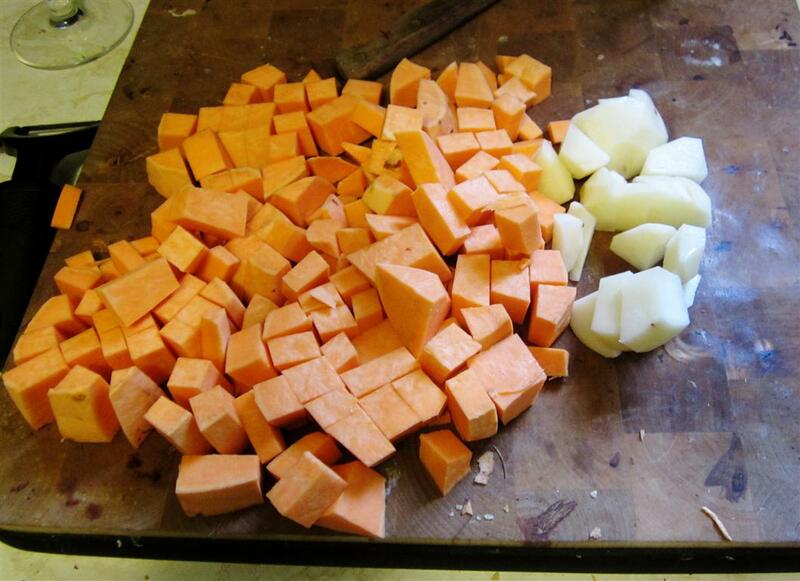 Chopped up both the potatoes into small cubes…well, sort of cubes…and threw those into the pot. 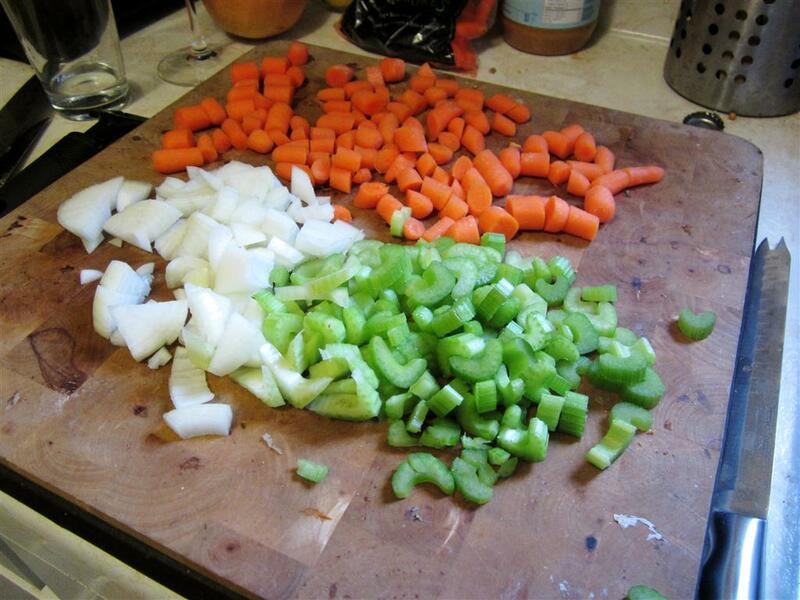 Next up…celery, carrots and an onion. 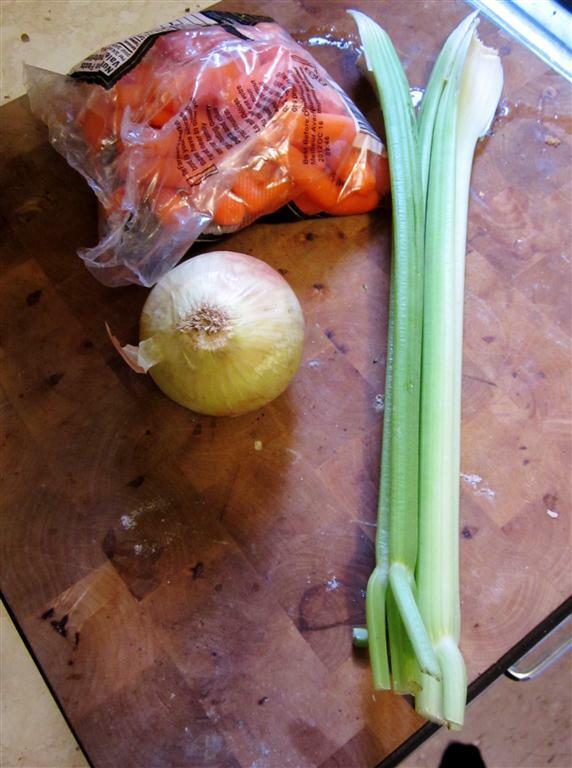 I used the full onion, about half the bag of mini carrots, maybe a little more, and three stalks of celery. Chopped them up and added them to the pot! 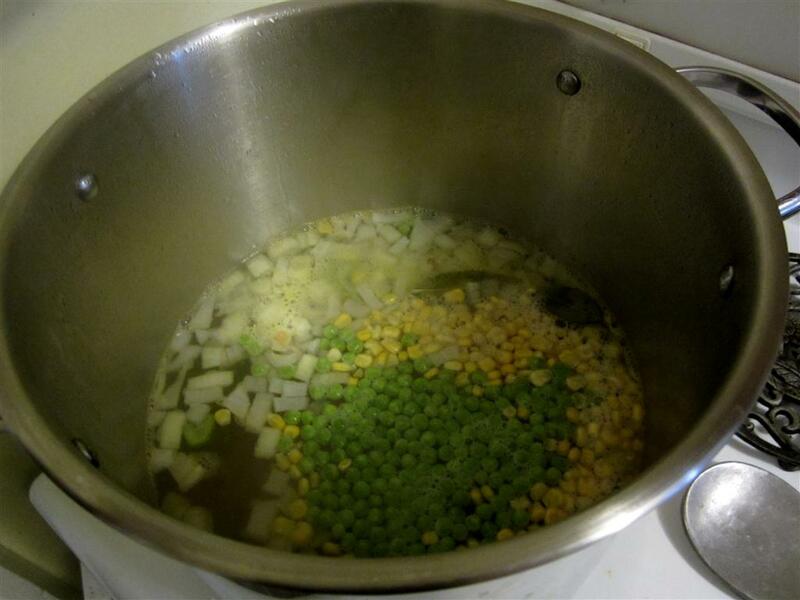 While searching for more veg to add…I glanced in the freezer and found frozen corn and peas. Figured, what the hell!, and added a handful of each! I added pinches of salt throughout the soup creation process. Add to taste. While the vegetables simmered, I prepped the final ingredient! The ham! 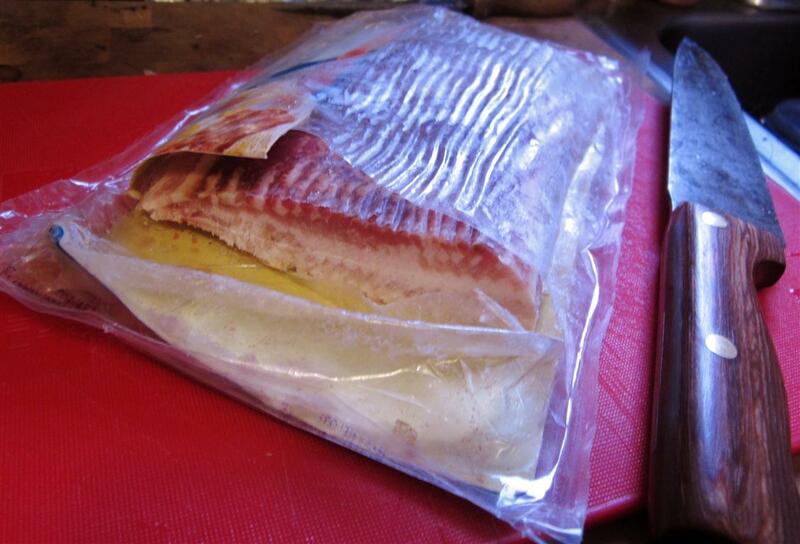 It was at this point in the process that I remembered I had bacon in the freezer. 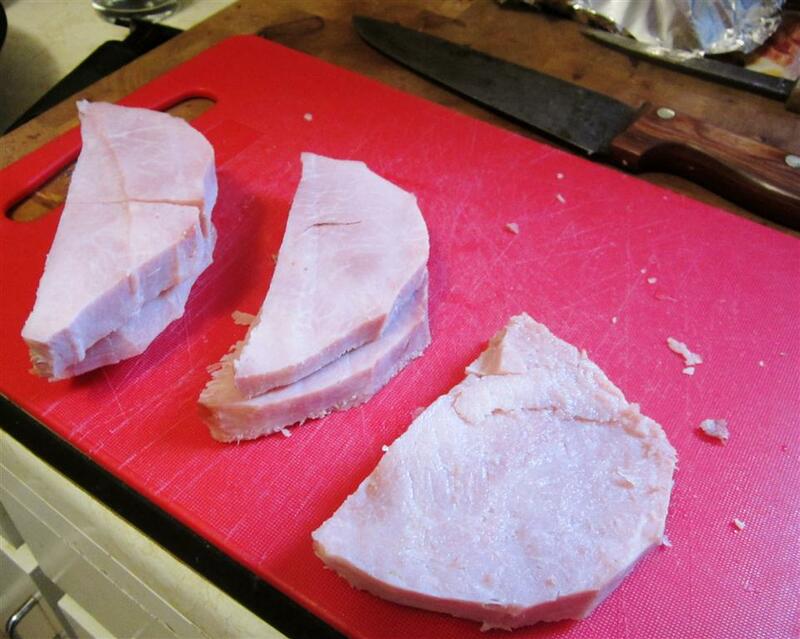 And of course, bacon goes with ham! Bacon goes with everything! Bacon.is.awesome. So I pulled out the package, cut off about an inch and added that to the pot as well. I figured the soup was on its way to being done, so I left it to simmer for 15 minutes or so. When I returned for another taste test, I found the broth incredibly lacking. It was bland, had very little body, and weak flavour. I called my friend Andy for advice, and he pointed me to my cookbooks…specifically The Flavour Bible. Yeah, yeah…he seems to know my cooking shelves better than me! I had completely forgotten about that book…which will not happen again. So useful! A book to add to your Christmas list! I looked through the list of Ham Friendly Ingredients, while keeping Andy on the phone for feedback. It worked! It sweetened and thickened the broth! 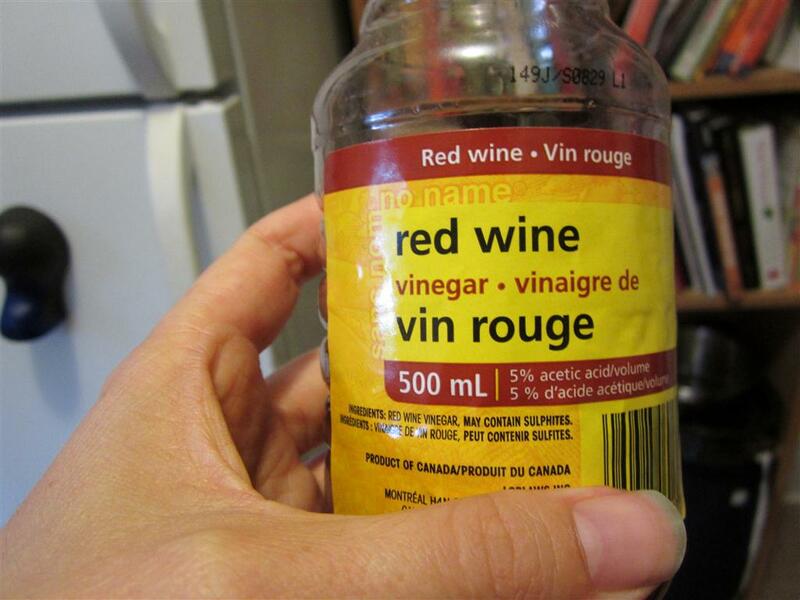 I continued to taste it between additions….definitely do that to ensure you’re on the right track! I left it to simmer for awhile…not sure about the time here…maybe 30 minutes or so. 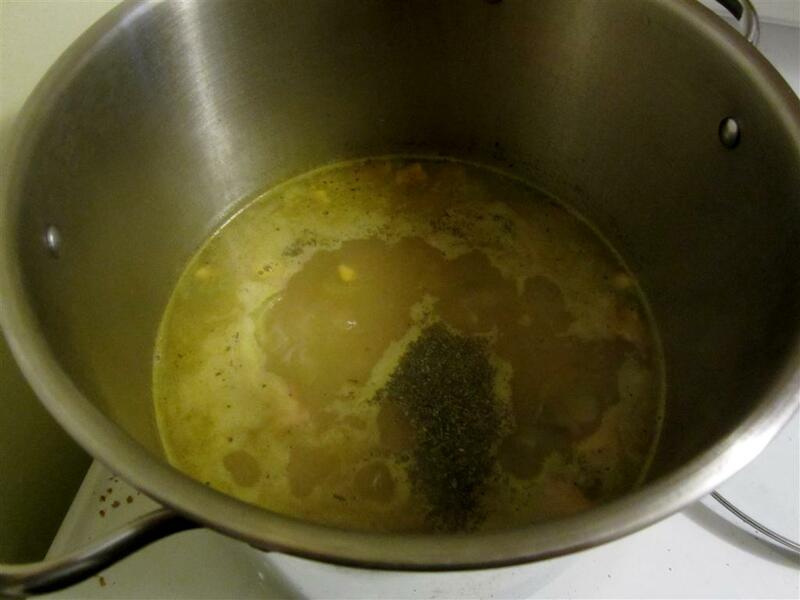 Some of that time I left it uncovered to boil the broth down a bit and help with the thickening. For dinner that night, I had AN AMAZING bowl of soup!! And I have to admit, I was pretty proud of myself!! I froze a number of portions and have since reheated bowls and it continues to be delicious! So, to sum up into some type of readable recipe-ish list…. Again, this is all dependant on what you have available in your kitchen! Get creative, add whatever you want and see what happens! I love muffins! Warmed with butter…they can be SO good! I recently got my hands on some quinoa flour and wheat bran…two ingredients I haven’t used before…and I searched online for a recipe that called for both items. I was also looking for a recipe that was healthy and that didn’t contain gobs of sugar and other garbage. 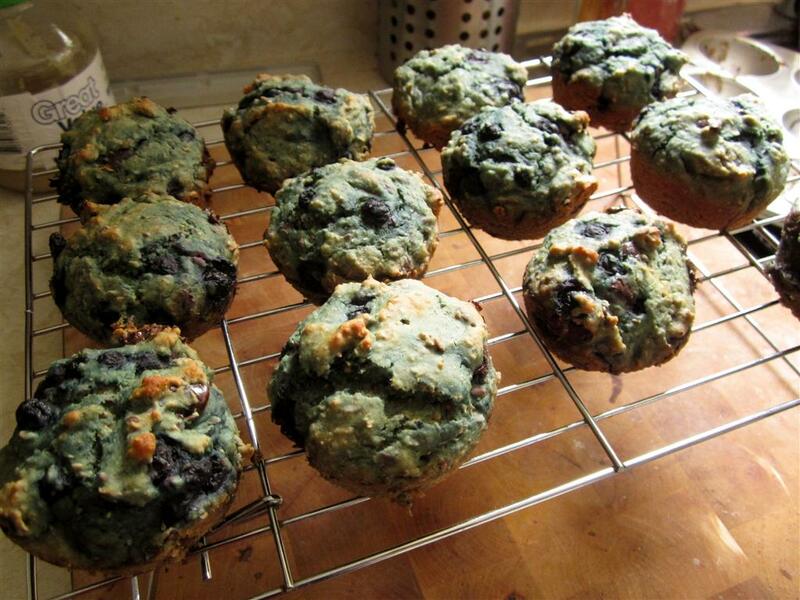 Within the first few pages of my Google search, I found this: http://www.livinghealthymom.com/chocolate-chip-blueberry-muffins/ Since I found this website, I have made these muffins a number of times and in many different ways. Those of you who know me well will notice that the photos in the post were taken both at my old apartment, and my new one. That is how long this post has been sitting in my Drafts pile! Right from the beginning, I found myself altering the recipe. The first time I made them, I didn’t have eggs, so I substituted more applesauce. I have used different berries (blueberries, strawberries), different types of chocolate chips (or none at all!) and have added coconut on occasion. They’re so simple! Although the dough is usually an odd colour prior to baking due to my use of frozen blueberries! You start out like any other muffin baking adventure…combining the wet ingredients: eggs, yogurt, raw honey, applesauce, olive oil and vanilla. 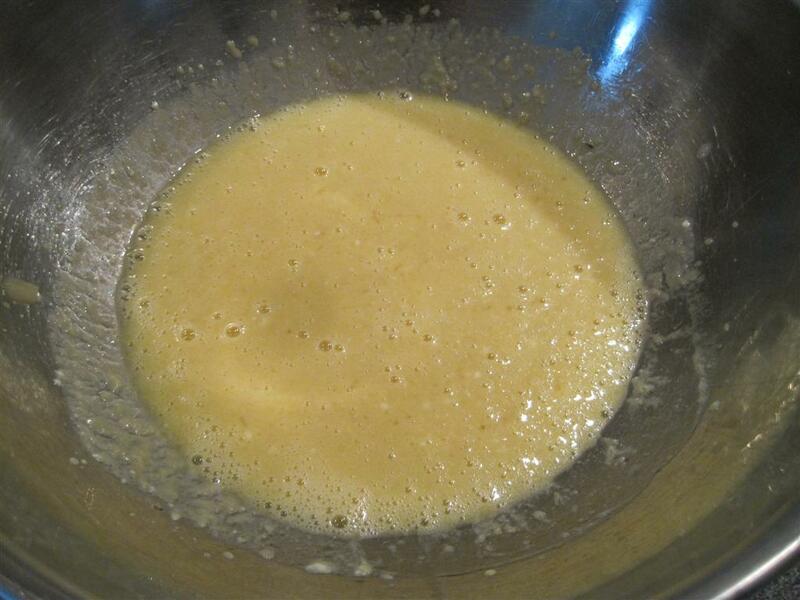 Mixed up wet ingredients…ready for step two! 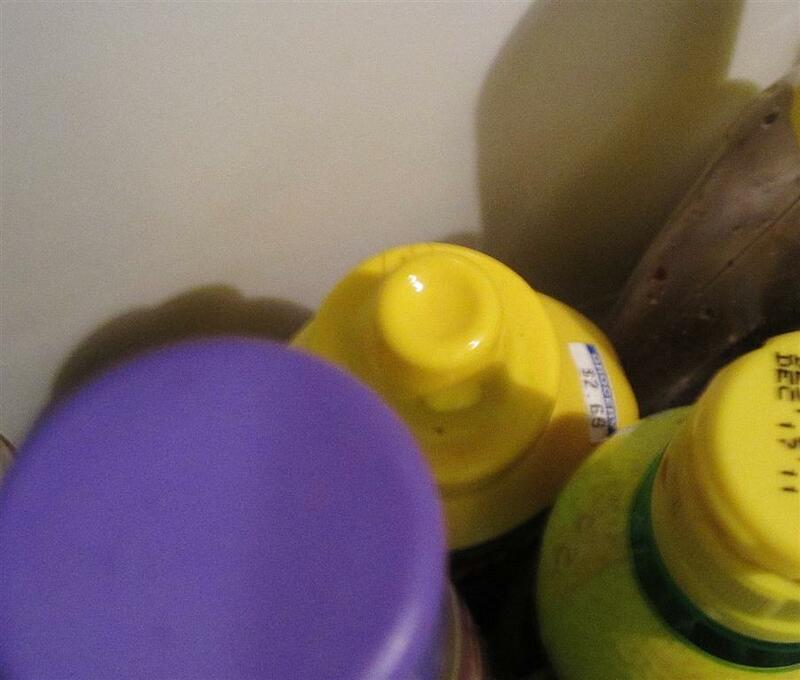 As a sidenote to all of this, I have had interesting adventures with both the eggs in my fridge and the honey in my cupboard. 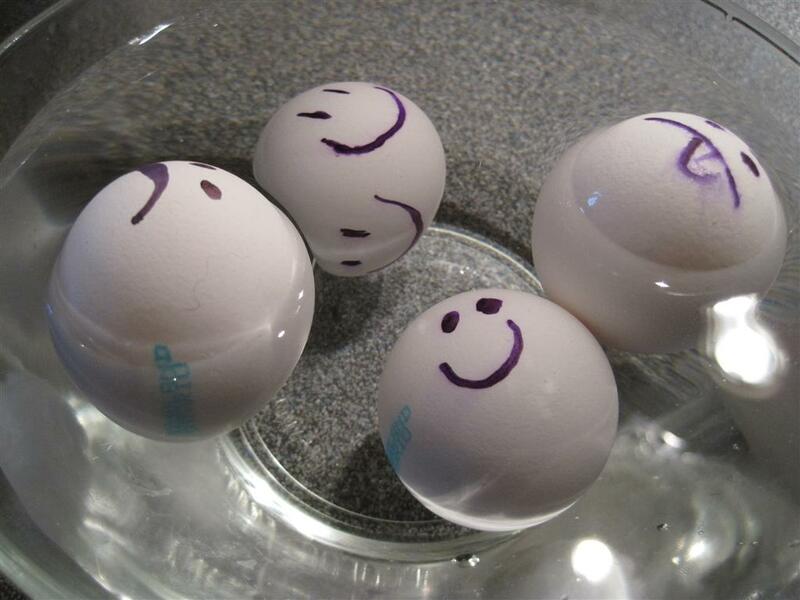 The eggs…well, there are times I lose track of eggs. They are supposedly a perfect shape, a perfect food, easy to prepare, easy to use…and easy to overlook. At one point, I had eggs, but I had no idea whether they were still good. I did some online research to find a way to identify the old and stinky from the young and nubile…Yeah yeah, nubile and stinky aren’t really opposites…deal with it. The old and stinky float! What I discovered was that old and either stinky or “almost” stinky eggs tend to float! And so, of my four eggs, two were happy to become muffin guts while the other two, sad to say, joined the compost party in my green bin. At the same time as this, I discovered that my honey was rock hard. 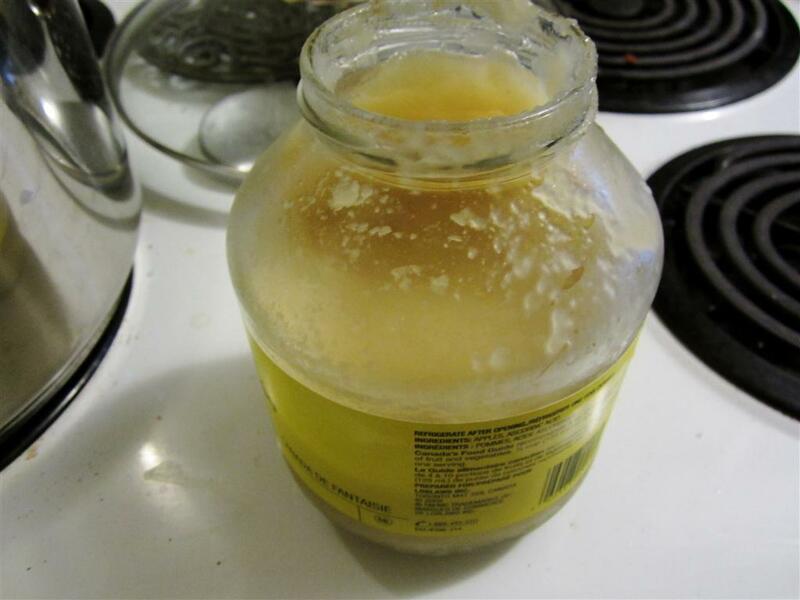 I have since moved to fresh, local honey but at the time of my initial muffin attempt, my honey was um…less than perfect? Hard and crystallized to be exact. Heating up my crystallized honey! 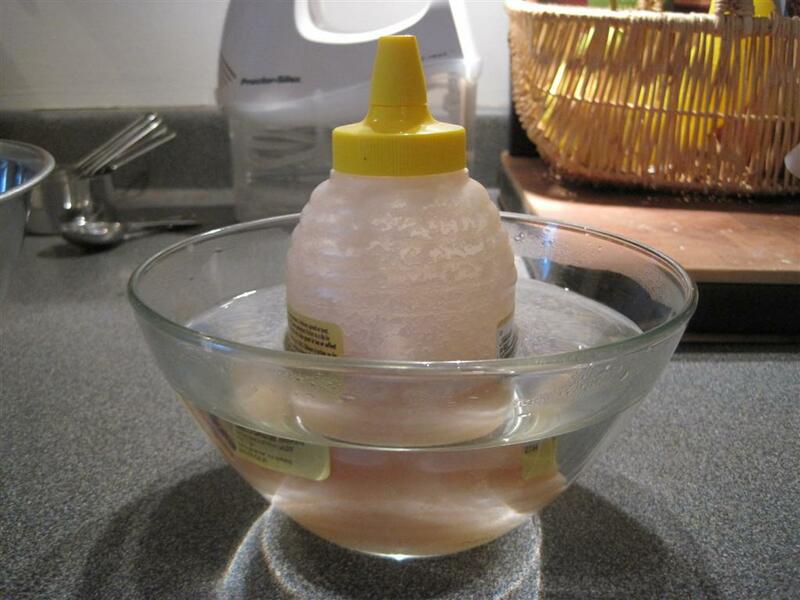 So while I prepped the other ingredients, the honey sat in a bowl of boiled water…which sort of worked. I have to admit, if you have access to fresh local honey…buy it. It makes all the difference! 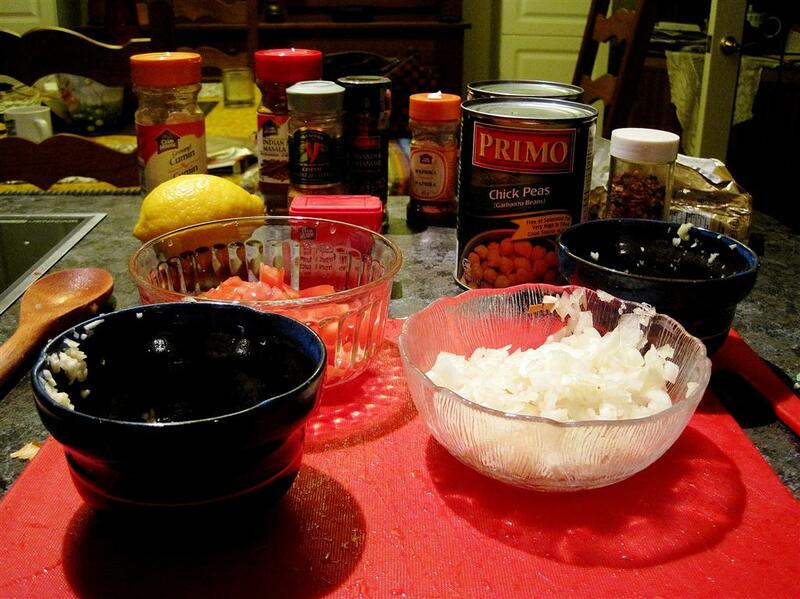 Next step…putting the dry ingredients together. 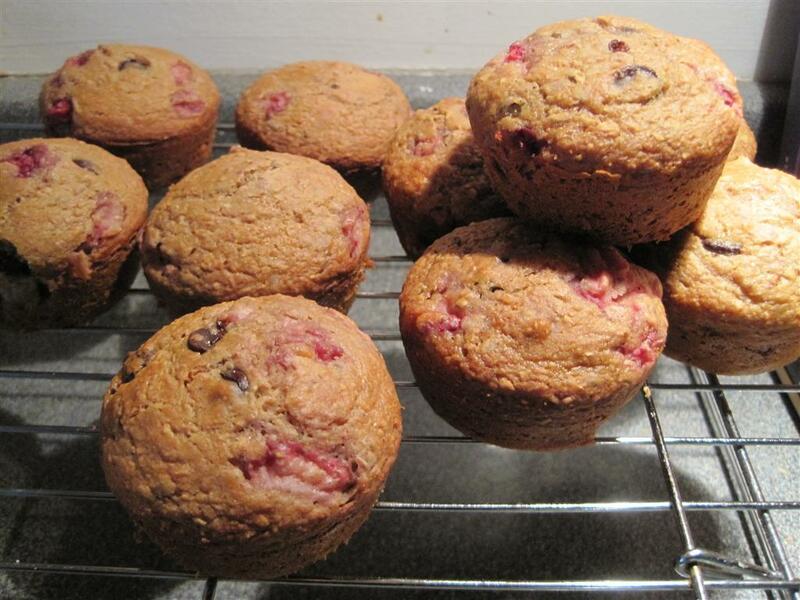 The first time I made these muffins was also the first time I used my new flour sifter!!! It was a little harder than I expected as the flour kept getting stuck between the two blades and I had to keep shaking it to keep the flour sifting. 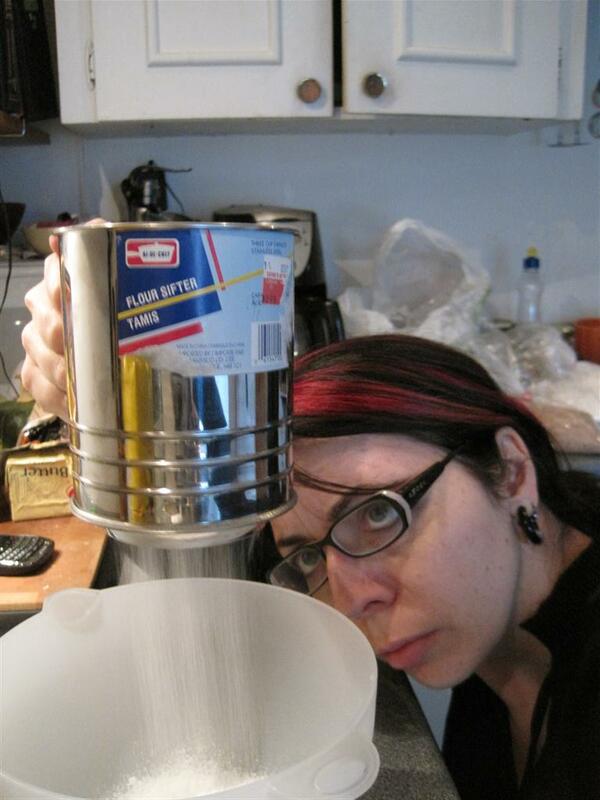 Buy a cheap sifter and work a little harder. But eventually, sifting was just neat! 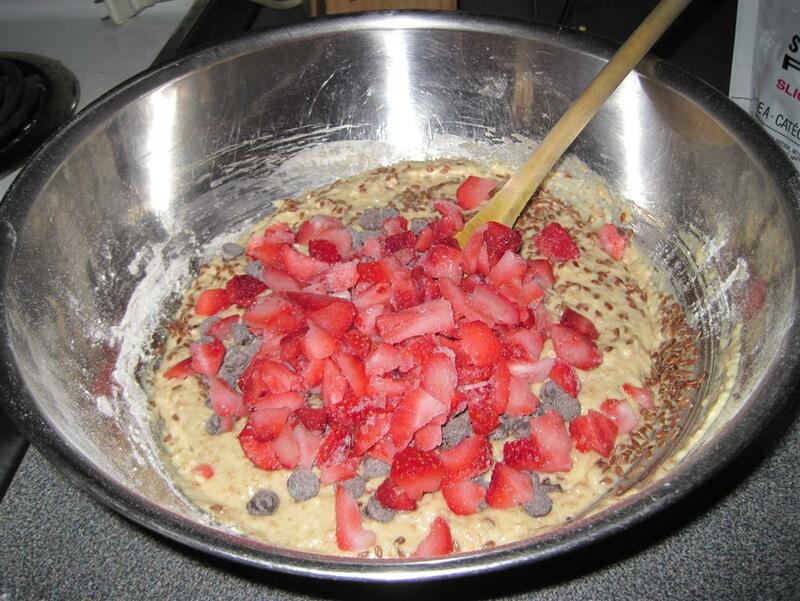 Once you’ve mixed your dough, add your berries, chocolate chips and coconut if you want. I tend to use frozen blueberries more often than not. I like to buy bags of frozen berries marked “Wild Canadian Blueberries” on the package. That way I know I’m getting the little wee berries that I used to pick with my mother as a child…you know the ones I mean…the tiny blueberries whose flavour absolutely explodes in your mouth when you eat them…a perfect mix of tart and sweet….Not these large overgrown blueberries we find imported year-round that have had all their flavour sucked out of them in exchange for large size and longevity. 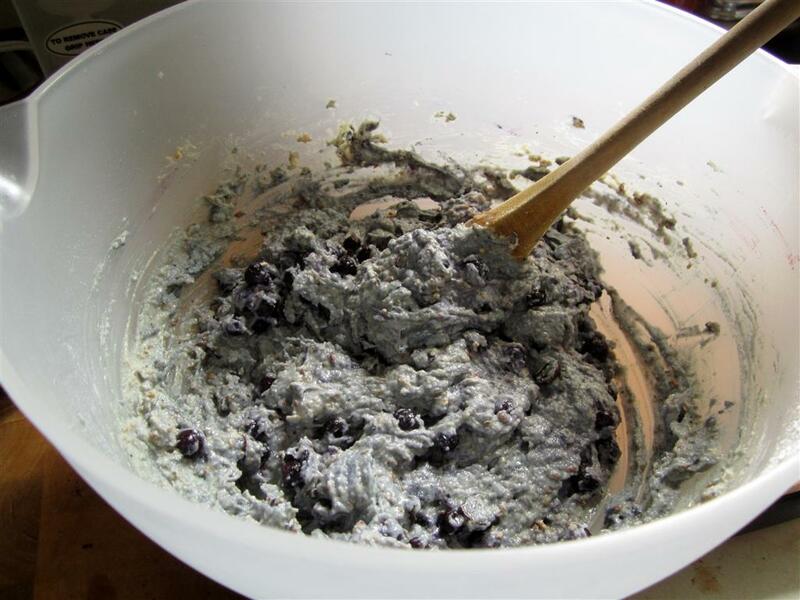 The dough gets pretty funky when you add your blueberries! Not so funky if you use strawberries instead….more pretty…. Then, of course, you move on to filling your muffin tin. 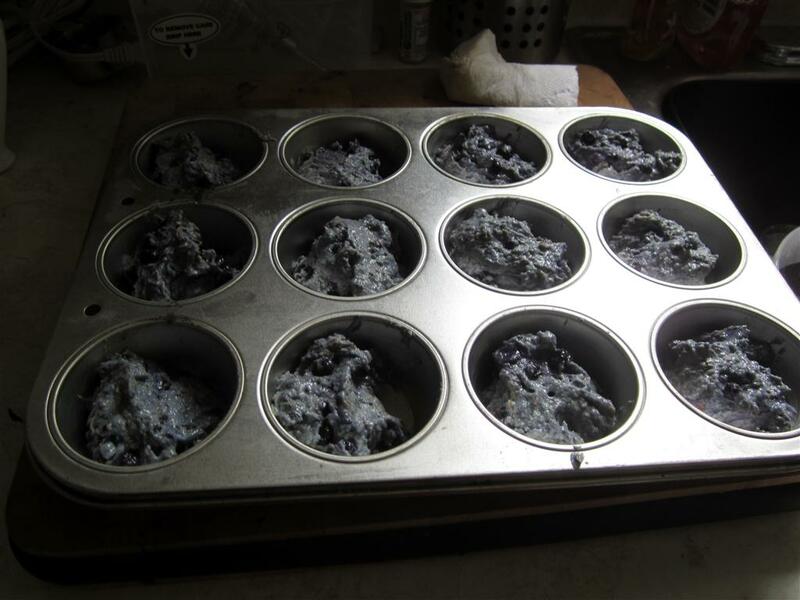 I was recently gifted with a non-stick muffin pan…had been using a metal one until then. GO BUY A NON-STICK MUFFIN TIN!!! They are a gift from the gods! lol No more scrubbing…no more broken muffin bits! *sigh* I love my new muffin tin! 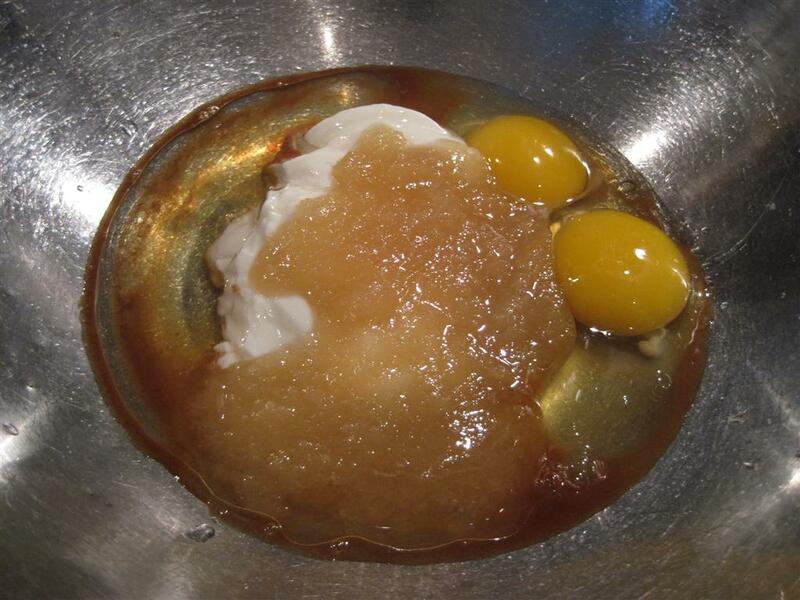 Using your mixer combine eggs, yogurt, raw honey, applesauce, olive oil and vanilla. Sift your flours, baking soda and baking powder together into a separate bowl. Stir in wheat bran. 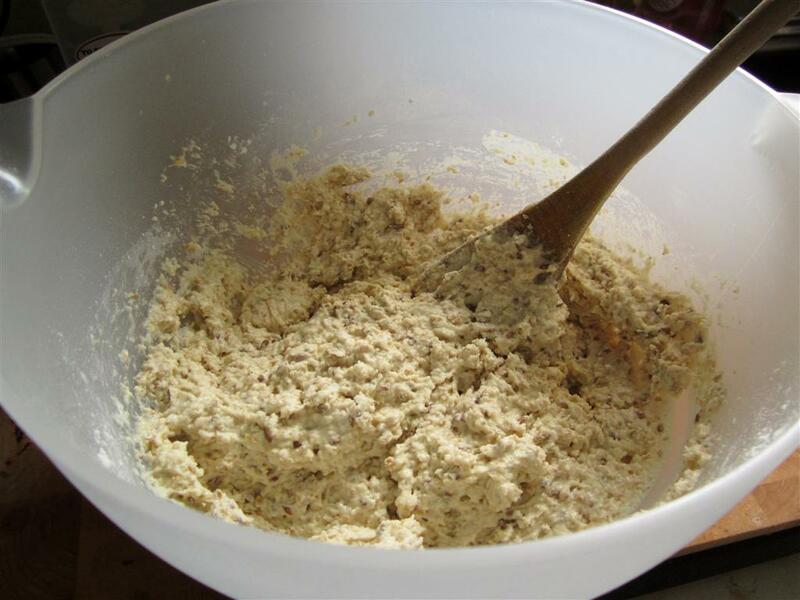 Combine your flour mixture and your wet mixture and mix by hand. 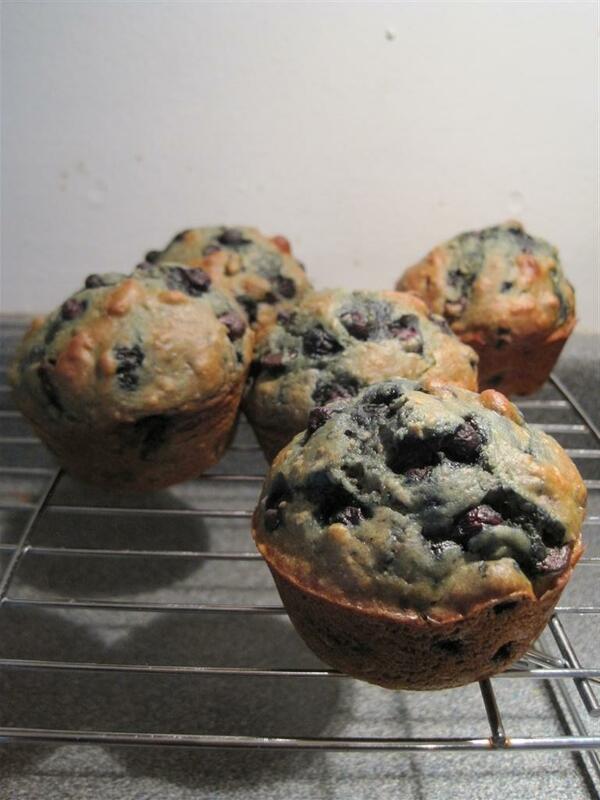 Stir in the chocolate chips/carob chips, the flaxseed and the blueberries. Grease muffin pans with a bit of butter. Serving size is 12 blueberry muffins using a standard size muffin tin, although I was able to make 10.